The current women’s record after last year’s inaugural running is 19:35 (6:18 pace) set by one of New England’s top Masters—Central Mass Strider Leslie O’Dell, 41, of Albany, NH. Give ‘Em Hell O’Dell will be plying her trade at the Mid-Winter 10M in Portland, ME on ‘Game Day’ so back to Fahey, ranked as the 7th fastest miler in NCAA D2 while a senior running for Bentley College in 2013. 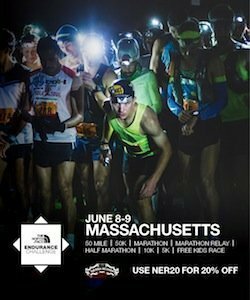 Now a member of the New Balance sponsored Battle Road TC, Fahey has bests of 16:58 for 5,000m and 4:49 for the mile. Last spring, in her debut marathon, she won the Providence Marathon in 2:49:34. Now residing in S. Weymouth, Fahey won the women’s division at the Dreamcatcher Classic 5M this chilly Thanksgiving in 32:09. So given a race day like last year, snow by the side of the road but dry and in the 30s, it’s Go Time for the Women’s CR to fall. Now on the men’s side, defending champion Patrick Bugbee of the Cambridge Sports Union has the inside lane. Bugbee ran 16:35 on the certified course last Feb. to win by a minute. Following the USATF-NE XC Championships in Franklin Park this past fall, there was some spirited trash talking post-event in Doyle’s Café between our champion and two-time NER Pub Series champion TJ Unger of the Hurtin’ For Certain Striders. Over the same course in June at NER Pub Series stop No. 4—the BHZ 5K—Unger placed 2nd in 16:07. Bugbee is coming off a PR at the Dublin Marathon. He’s also signed up, Unger isn’t as of yet, so we shall see. (Photo: Caitlin Fahey running 17:32 at the 2017 An Ras Mor 5K, Photo by Scott Mason). If the BAA’s Michael McGrane (in yellow) wants redemption, he’ll have to sign up on the Pre-Game website. Festivities take place at the Barrel House Z Brewery in S. Weymouth on Super Sunday!